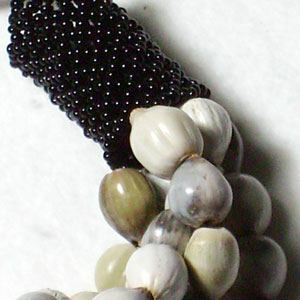 Bracelet with 5 strands of Job's tears and black glass beads with beaded tube. Length: approx. 23cm, adjustable. 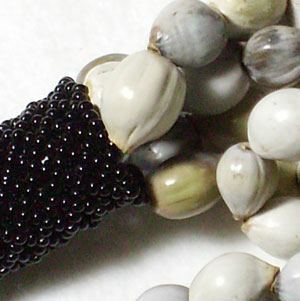 Job's tears are teardrop-shaped, pearly white/grey "beads". 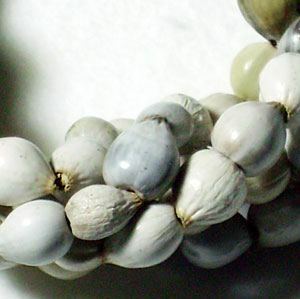 Interestingly enough, the actual bead resembling a seed is not a seed at all. It is a little shell containing flowers and grains. Absolutely stunning and excellent quality! Handmade in South Africa. 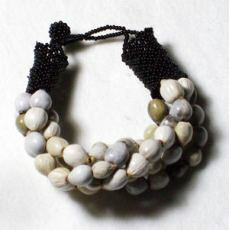 Each piece is handmade and can therefore vary in size, shape and design. We are happy to help.Note: All prices include the legal VAT and do not include shipping costs. Do you want to visit our showroom? Please call us to arrange a time.